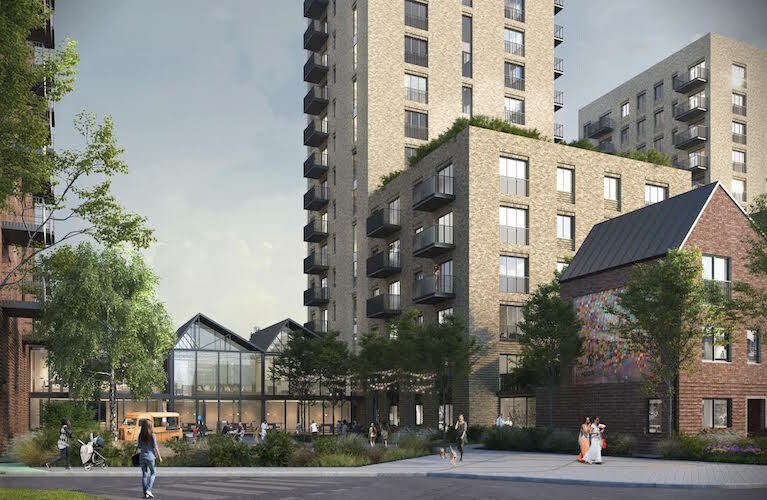 Transport for London (TfL) has taken a further step towards meeting its target for getting new homes built on land it owns by announcing leading residential developer Grainger as its intended partner in a build-to-rent programme. Eight sites across the capital will be developed under the arrangement once it is finalised, together yielding at least 3,000 new dwellings in all. TfL and Grainger say that on each site a minimum 40 per cent of the homes will meet Sadiq Khan’s definition of being “genuinely affordable”. Around half of the total are expected to be built at the Limmo Peninsula as part of the wider, Crossrail-related regeneration of Canning Town and Custom House. The 3,000 homes will count toward’s TfL’s target of seeing 10,000 started on TfL land by 2021, with an overall 50 per cent being affordable. They will be delivered by means of a joint venture company, 49 per cent of which will be owned by TfL and 51 per cent by Grainger. Armourers Court, Woolwich (up to 400 homes). Arnos Grove Underground station (up to 100). Cockfosters Underground station (up to 300). Hounslow West Underground station (up to 350). Limmo Peninsula, Canning Town (up to 1,500). Montford Place, Kennington (up to 100). Nine Elms Undergound station (forthcoming; up to 400). Southall sidings (up to 400). Grainger is already collaborating with TfL over part of the Seven Sisters regeneration project, which will see land above the Underground station owned by the transport body transferred to Grainger as part of the redevelopment of the Ward’s Corner site following the government’s recommendation that Haringey Council’s compulsory purchase order relating to land in the area should go ahead. In February, Grainger and Haringey conducted a topping out ceremony to mark the structural completion of another part of the Seven Sisters scheme, which will temporarily house the “Latin Village” indoor market prior its planned relocation back to the Wards Corner site following its redevelopment. TfL already has joint venture partnerships with other commercial developers and housing associations to develop housing with a mixture of tenures at sites in Hillingdon, Waltham Forest, Southwark, Harrow, Greenwich and Kensington & Chelsea as well as the currently stalled Earls Court project. They are also working on schemes with Pocket Living and Apartments for London. Build-to-rent homes are seen as likely to be delivered more quickly than some other types and as meeting an important, growing demand, as recognised and supported by business group London First. TfL has submitted planning applications for more than 4,200 homes so far and work has commenced on 300 of them. Of the consents secured since Sadiq Khan’s election in May 2016, 50 per cent of the homes have been “affordable”. Image shows Grainger plans for the Southall sidings site.